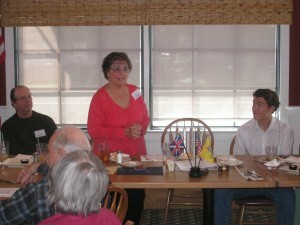 On Saturday March 6, 2010, Michael and Jean-Marie were the guest speakers at a luncheon of the Redwood Empire Sons of the American Revolution. 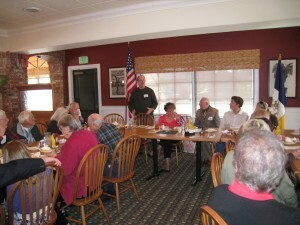 The event began at 11:30 a.m. at Marie Callender’s Restaurant and Bakery, 2460 Mendocino Avenue in Santa Rosa, CA. A book signing followed. 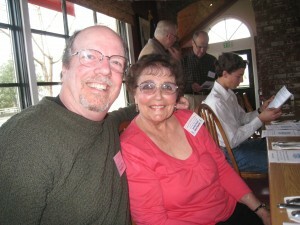 Michael and Jean-Marie at the luncheon. Michael speaks to the audience. Jean-Marie with the child survivors of war-torn Manila. 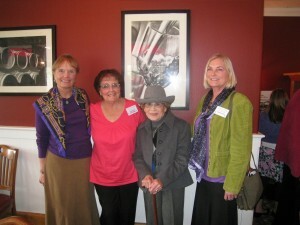 The two women on the ends, from left to right, are sisters, Susan DeVoe and Karen Everard. They were both very young children interned at Santo Tomas with their family, the Magnuson family (parents Chet and Frieda). The woman in the middle with Jean-Marie is Pat Sutton, who lived in Manila during the war.